IN LATE 2016, ROBERT PASCHALL JR., A MAVERICK DIRECTOR OUT OF DALLAS, SHOT AN ENTIRE FEATURE FILM IN ONE DAY. THE RESULT IS A FUTURISTIC THRILLER TITLED SEGFAULT. PASCHALL EXPLAINS BELOW HOW HE CAME UP WITH THE CRAZY IDEA AND HOW HE BRILLIANTLY PULLED IT ALL OFF. 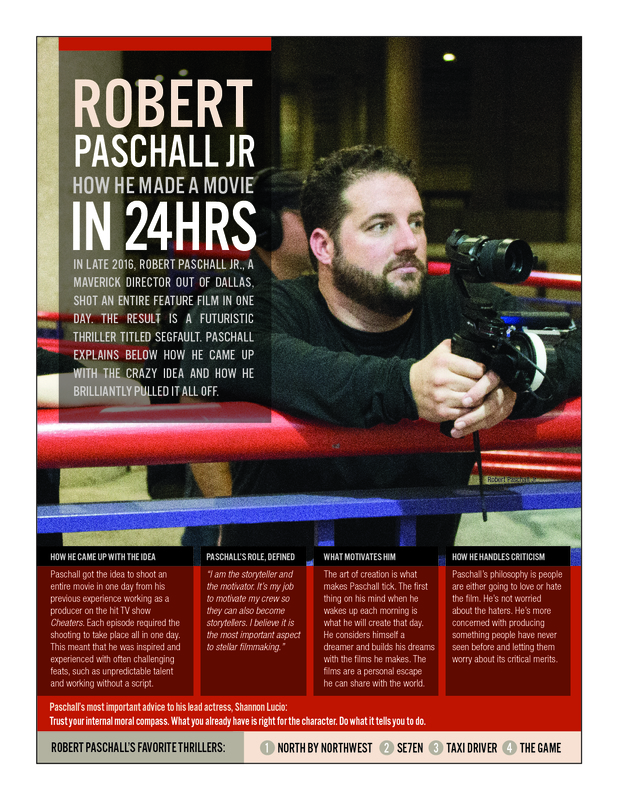 Paschall got the idea to shoot an entire movie in one day from his previous experience working as a producer on the hit TV show Cheaters. Each episode required the shooting to take place all in one day. This meant that he was inspired and experienced with often challenging feats, such as unpredictable talent and working without a script. The art of creation is what makes Paschall tick. The first thing on his mind when he wakes up each morning is what he will create that day. He considers himself a dreamer and builds his dreams with the films he makes. The films are a personal escape he can share with the world. Paschall’s philosophy is people are either going to love or hate the film. He’s not worried about the haters. He’s more concerned with producing something people have never seen before and letting them worry about its critical merits. Trust your internal moral compass. What you already have is right for the character. Do what it tells you to do.